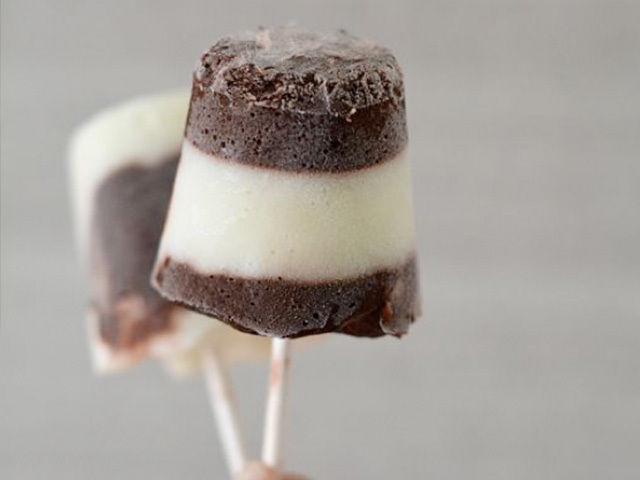 Fudge pops are one of the best ever low-fat desserts. What is not to love about a popsicle of frozen chocolate treat at the end of the day? I remember buying them at the corner store when I was little. But now I make them at home. Why? Because the homemade version is amazingly easy and tastes much better than the ones you can find at the store. It is easy to see why when you read the ingredients in the recipe—it’s mostly chocolate and milk with a little flavor thrown in. There are no preservatives or funny things you can’t pronounce. Since my kids are little, I make these simple pops in paper cups with lollipop sticks or popsicle sticks. This keeps the portion size perfect, and I don’t have to worry about the kids breaking plastic containers. Here is how we make them at home. And, of course, you can stripe or swirl them in whatever pattern you like! Step 1: Place two microwave-proof bowls on the countertop. In one bowl place the chopped chocolate. In the second bowl place the white chocolate. Add 1 cup of the milk, ¼ cup of the cream, 2 tablespoons of the sugar, the cocoa powder, 1 teaspoon of the vanilla extract, and half of the salt to the bowl with the chocolate. Add the remaining ingredients to the bowl with the white chocolate. Step 2: One at a time, microwave each bowl until the chocolate is melted. Then use an immersion blender, or whisk the mixture aggressively, until the mixture is completely smooth and emulsified. Step 3: Place 8 cups on the counter and fill them ⅓ full with the chocolate mixture. Then place the cups in the freezer to chill for one hour. Then, return them to the counter and fill them ⅓ full with the white chocolate. Chill them again for one hour. Lastly, fill them with the remaining chocolate and insert a lollipop stick. Freeze for at least 6 hours. 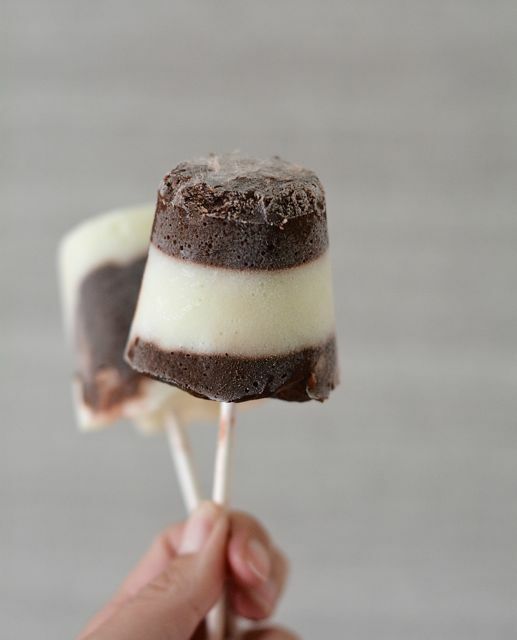 *Note: Stripe the fudge pops as you desire!